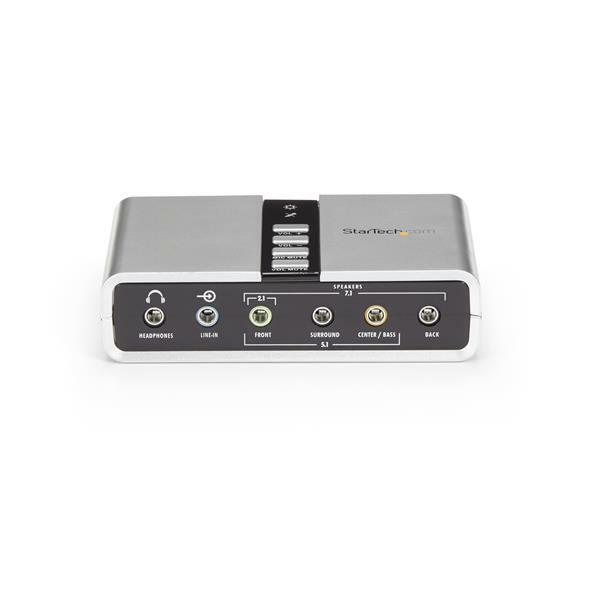 The external USB sound card features easy-to-use volume control and two external microphone inputs - a convenient solution for any audio application requiring high quality sound with multi-input capability with support for 44.1 KHz and 48 KHz sampling rates for analog playback and recording or 48 KHz for SPDIF. 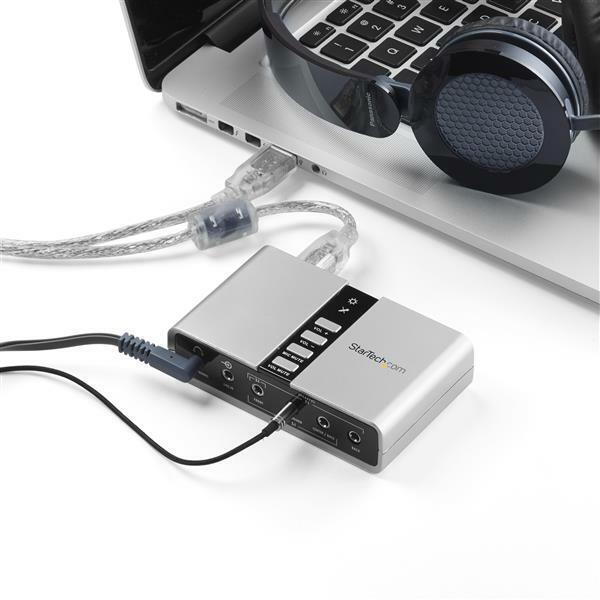 Designed to deliver a long-lasting and dependable sound solution, the External USB Sound Card/Audio Adapter is backed by our 2-year warranty and free lifetime technical support. 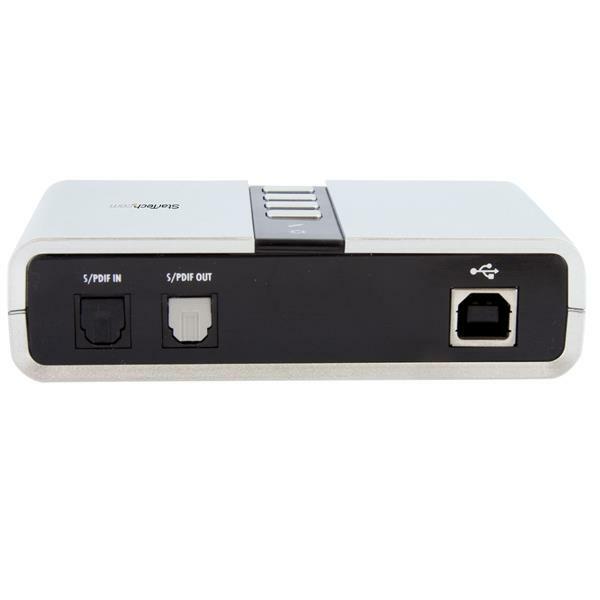 Note: The audio adapter’s SPDIF optical pass-through port supports two-channel audio, this port does not support 5.1 or 7.1 audio. Note The audio adapter’s SPDIF optical pass-through port supports two-channel audio, this port does not support 5.1 or 7.1 audio. 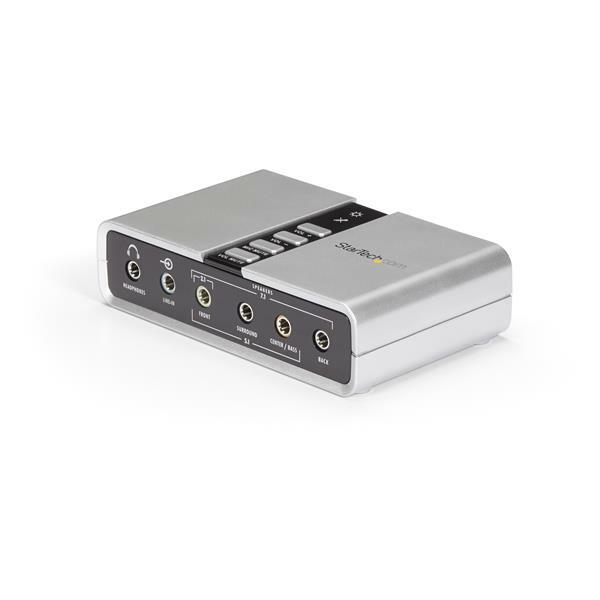 I bought this external card to be able to use my Logitech Digital Audio controller for my 5.1 speakers and my new Dell Optiplex 7060, which apparently offers no internal sound card option with a digital audio connection. No problem, except that I get an annoying buzzing sound at any volume, and it's only working in stereo mode and pretty low quality from what I can tell, Something isn't right, but I can't figure out what to do to fix it. We're very sorry you ran into some problems. For analog 5.1 surround sound to work with this product, you will need to install the software application and set audio playback to be 5.1. You will also want to set this in Windows within Control Panel, Sound. If this doesn't help or you wish to troubleshoot the situation further, please reach out to us using the our live chat or call us directly. I purchased this unit because I use a Small Form Factor PC with limited upgrade options. On the photos I could see it has a lot of connections. I wasn't interested in the 7.1 features, but more for recording purposes, especially the optical input. The C-Media Audio chip in this device is quite basic, limited to 16 Bit and 48 KHz. So it won't do 24 Bit or 96 KHz or any of that. The specifications and manual mention that the S/PDIF optical input is only pass-through, yet it shows up as an input in Windows 10 and you can record just fine with software such as Audacity. The specifications mention dual microphone inputs. Yes there are 2 ports, and you would assume that you can connect two microphones, but this is not the case. Windows audio properties show only a single microphone input. The way this USB audio device is setup is that the left mic port is for the left channel, and the right port for the right channel. Rather than have a single mic port that does Stereo. Very strange and means if you have standard Stereo Mic you need to get a Y-cable. Finally the device has optical-in, line-in and mic-in. 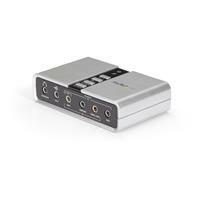 On a standard sound card you can use all the inputs simultaneously. For example receiving music from the line-in, while doing a voice over through the microphone. But this device only supports on of these at a time! So it's either optical in, either line-in or either mic in. But you cannot use two or three inputs at the same time. I'm amazed at this limitation and that this is not mentioned. The driver seems to be quite old and mixer has just two sliders for volume and CD, which makes no sense. There are no sliders for the other ports. The software and driver doesn't seem to add much compared to the built-in functions that Windows 10 provides. On the positive side the build quality seems solid. The buttons on the unit as handy, but most keyboard have the same volume and mute button. The mic mute button though can be very useful. The power LED blinks all the time which is a bit strange. All in all the product didn't meet my expectations, especially that you can only use one input source at a time and that this wasn't mentioned anywhere. Thank you for your review of ICUSBAUDIO7D. We're always looking for ways to improve our products, and we appreciate your detailed feedback. Please remember, if you have any problems with our products, our Technical Advisors are available to help 24 hours a day, 5 days a week. To reach one, go to www.startech.com/support. (5 stars) Bought for the wrong reason, but supprised. I have an old Klipsh computer sound speaker system (whose sub is also an amp.) that was paired to a (at that time) high end gaming computer's sound card. Computer long gone now. Found a convoluted way to hook up these speakers to a retired HK receiver using only the pre-amp functions as the amp portion was dead. HK amp fully died. Needed solution to use speakers system. PS: this is still a very good sounding system for my bedroom. Found your 7.1 USB Audio Adaptor. Hoped I could just use it without the computer. No go. Disappointed. Used my notebook. Worked, sort of. Only 2.1 and no headphones. Hmmm. Drivers down loaded automatically were generic. Try the disc, not compatable with Win 10. Went to you web site, got Win 8/10 drivers. WOW. Impressed for such an inexpensive item. Everything works,. Controls the amount of speakers to use and can even use other audio players via the input. Still checking it out, but happy now. Can't run it without the notebook, but for the price, that's OK. I had purchased a new computer but it didn't have the output for 5.1 for my speakers so I purchased this nifty item. The disk that came with it didn't have the drivers I needed so I downloaded the software for it and I got my 5.1 sound back. I am a happy camper rock'in out to my tunes. (1 star) Only 2 channels with Mac! 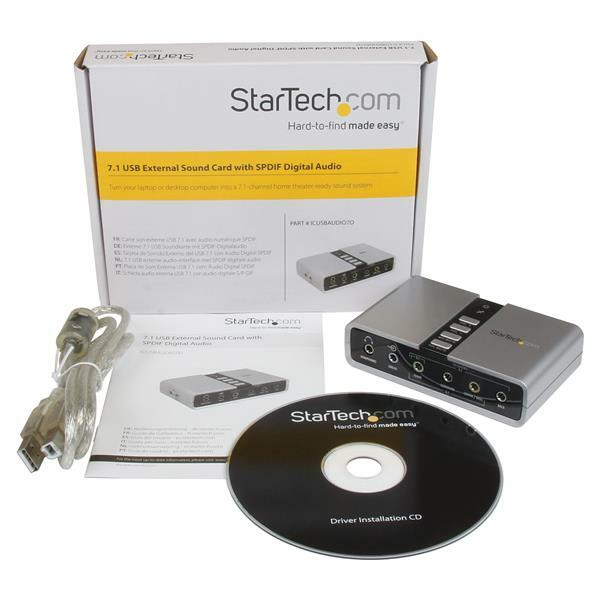 I bought this to get multichannel playback out of my MacBook Pro (13",2017, OS X 10.12.6). Plugged it in, and sure, it was recognized... as a stereo device! We apologize this won't work for your application, but the ICUSBAUDIO7D doesn't currently list support for macOS. It only officially supports Windows and we don't expect it to perform as expected on other operating systems. We don't currently have another similar product with support for macOS Sierra (10.12.6). I got this as a Christmas gift from my parents last year. I'm finally getting around to using it and it is not sending a signal to my receiver. I can see the blue light blinking on top of the box but there is no red light coming from the S/PDIF. Was installing this on a Windows 2008 Server, and was concerned about having to install extra software that might cause some issues with the software we are currently using. Thankfully, the driver was already in Windows, so no added software, which meant that no ill effect to the system. Just, now we have sound. Very nice. I broke my headphone jack on my laptop and this product fixed all my problems quickly with no effort other than to plug it in and change a couple of settings in the sound options. Very happy customer right here! I have had one of these for over a year now. Best thing about this card is the ability to have more than one input working at the same time. Windows DRM since Vista has disabled the ability to have Line in and Microphone working at the same time. Since I have two computers, one connected to line in on this and a microphone for talking to friends it does exactly what I need. I have purchased several audio cards and spent hundreds on some that couldn't perform as well as this one. There is no way this is better than in internal sound card. An internal sound card has a high end processor that just eats this thing for lunch. I work for a hearing company and we did test this and other options. Unless it is on board sound you meant? On board and internal dedicated higher end sound card is completely different thing. We use these for 5.1 audio as they need no driver. They just work for what we need at the price point. I would definitely recommend these but not on the basis that it is better than internal audio card. This misleading. (5 stars) Works as promised! This is an excellent audio addition with a 5.1 or 7.1 speaker set. I can work much longer when listening to music through this unit. I bought this USB sound card a week ago, its amazing!